Hurricane Matthew continues to gain strength as it moves westward in the Caribbean Sea and is expected to turn north this weekend towards Jamaica and Cuba. Some long range computer models have Hurricane Matthew making landfall with the east coast of the United States late next week. We will continue to monitor this tropical system and send updated DOC Alerts as the forecast develops. In the meantime, if you are in need of our services please call the MediGroup Emergency SRM Hotline: 888.243.5760. 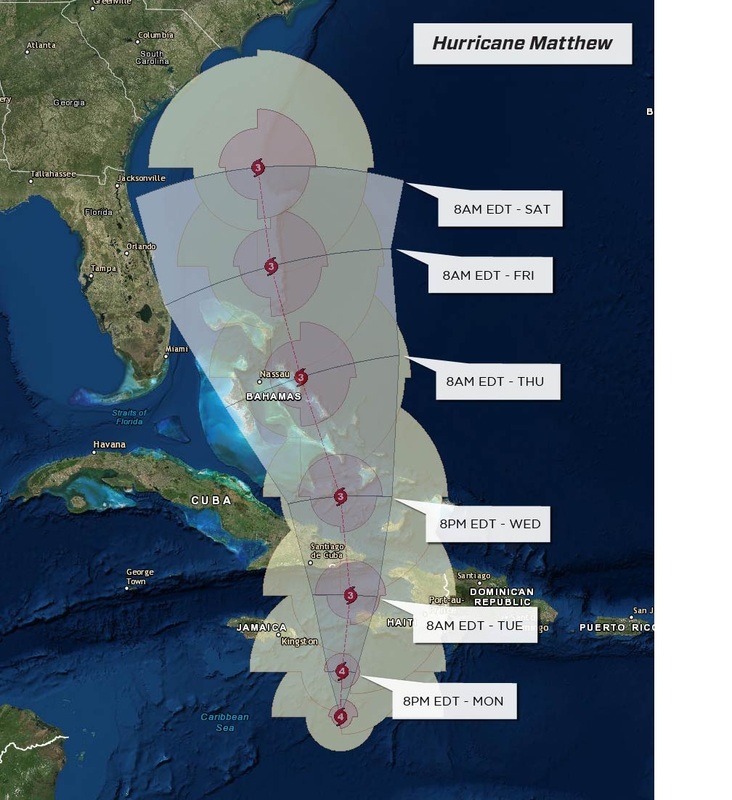 Matthew became a Category 2 hurricane early Friday morning with sustained winds of 100 mph. Matthew will continue to slowly strengthen today as it sits in an area of relatively low wind shear and warm ocean waters. As Matthew continues moving westward across the Caribbean Sea, heavy rainfall totaling between 2-4 inches will fall on the islands of Aruba, Bonaire and Curacao into the day on Saturday. Additionally, wind gusts up to 60 mph are possible on these islands. Matthew will likely strengthen into a Category 3 hurricane into the weekend despite moving into an area of slightly higher wind shear. The hurricane will move westward across the southern Caribbean into the weekend, then make a turn toward the north. It is important to note that there remain vast model differences as to when a turn to the north will take place and how sharp it will be and, as such, the track of Matthew beyond Saturday remains highly uncertain. However, it appears as though Jamaica, Haiti and eastern Cuba should prepare for hurricane conditions later this weekend.